I’ve had to strap myself in for the last couple of weeks riding this roller coaster called ‘life’, and have had all three hands busy at the wheel. 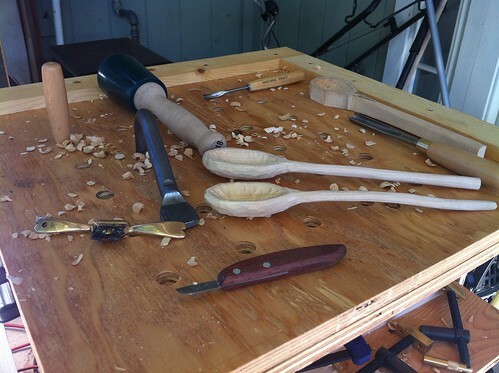 Anyways… I am never too far removed from the spoon carving addiction. For those of you that might still be in this spoon carving process, I wanted to mention a couple of words regarding ‘finishing’. Of course, that word carries two different connotations. The first being, “get ur done” and the second is applying a ‘finish’ to seal and/or protect the wood. While the first use of the word might be the most useful at this point, I am instead going to look at the second…. The application of some sort of finish. Not being one to create something that is actually functional, I have the luxury of being able to experiment with a broad range of finishes…. and have over the years. But in discovering that I am inherently lazy and have an acute case of ‘get-it-done-itis’, I have come to appreciate those finishes that are easy to apply, dry quickly and give an elegant look to the wood without a gloppy buildup. The tactile quality of the finish is as important to me as the visual. If it feels like plastic, I don’t like it. If the wood feels ‘dry’, I don’t like it. What I do like is… for the finish to showcase the grain of the wood, giving a ‘saturated’ appearance to the natural color of the wood and without distracting in any way from the wood… or the spoon. This is what I like, but have yet to fully and consistently achieve it. There is this look that I have heard referred to as a ‘gallery finish’. I’m sure that means different things to different folks, and for me it is more of something I recognize in other’s work. So before leading into a brief and incomplete listing of possible finishes, the best recommendation that I can give for finding the right finish is that when you see a finish you like, ask the maker how he or she went about it. And then experiment. 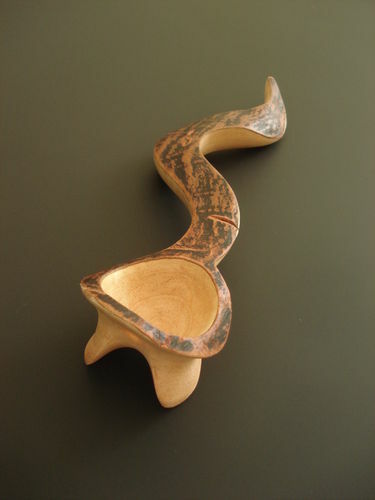 Of course, in making functional spoons, there are many more considerations to choosing a finish other than look and feel. I mean, you might actually be putting that thing into your mouth (or at least your food)… so your choices are going to be limited to those finishes that are approved for such a use, aka NON-toxic. But you really don’t have to sacrifice the aesthetic qualities in order to obtain a finish that will also extend the useful life of the spoon. You gotta,I mean just gotta use a finish that is water repellent. There are two kinds of finishes…. penetrating and film-forming. The film-forming finish is going to chip, crack and, with use, in a very short time going to become a mess. Water has a way of messing with wood, causing the wood to expand… and then as the wood dries it shrinks… and then your really cool spoon splits down the middle. The penetrating finishes are far better suited to protecting the wood spoon, not only from water, but from heat and even stains (spaghetti sauce and the such). Most of these are going to be some sort of oil, or oil combination (usually wax). Some folks use vegetable oils but they go can rancid after a bit. I suppose you could wash and reapply regularly and that would help… but still, I think there are better alternatives. Coconut oil is reportedly resistant to rancidity. Walnut oil and Almond oil a bit less so. Although, it seems like there are a lot of makers that swear by the Walnut oil. Mineral Oil seems to be quite poplar, in part because it is easy to come by, inexpensive, easy to reapply and doesn’t go rancid. Sometimes it is combined with a wax (paraffin or beeswax) for more protection. Mineral oil is petroleum based and that is a little weird when you think of it. Raw Linseed (flaxseed?) oil has been used. Is that stuff still around? 100% Pure Tung Oil can be used.. just make sure that it is not one of those tung oil ‘finishes’ with all sorts of additives. Pure tung oil dries really hard and makes for a durable finish. 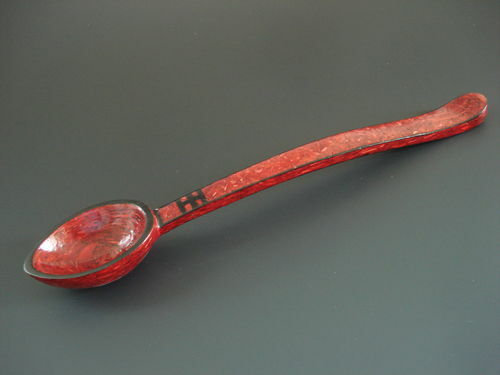 I think if I were to make a functional spoon, and I am sure I will one of these days, I will probably use Tung oil (I have it) or the mineral oil…. Or maybe the walnut oil. (That sounded ambivalent?). Some of the prepackaged finishes could be used. “Good stuff”, Behlan’s Salad bowl finish and Meldo’s, etc…. A lot of these have unnamed ‘drying agents’ and I’m not really sure what they are…. So I’d be tempted to shy away from them. The Behlan’s I’ve used before, but not on a functional spoon. One thing I liked about that product was that I could build up coats gradually and the finish came out looking almost like a lacquer. Even though I believe it is billed as penetrating, it does build up a ‘skin’ and I think under heavy kitchen use, this could chip and lead to all sorts of problems. No matter which product you use to finish your spoon with, it is recommended to allow a curing time before use.. depending on which product this could be several days. Oils ~ Easy to apply, penetrates the wood, rag on-wait-rag off. Varnish and Polyurethane ~ Good protection but dry slow, allowing for dust contamination. Usually brushed or sprayed in coats with sanding in between. I have pretty good luck with thinning the stuff and wiping on with a lint free cloth. Takes a few more coats but gives a respectable finish, if not totally durable. Shellac ~ Fast drying (alcohol based), limiting dust contamination… but you’ve gotta work fast. Lacquer ~ Fast drying as well, beautiful finish for those that have the skill. I usually mess it up even with the fool proof sprays. Water-based finishes ~ Basically latex paint without pigment. I never got interested enough to try them. Plus, I don’t think they are that durable. Personally, for non-functional spoons, I like the Waterlox satin. 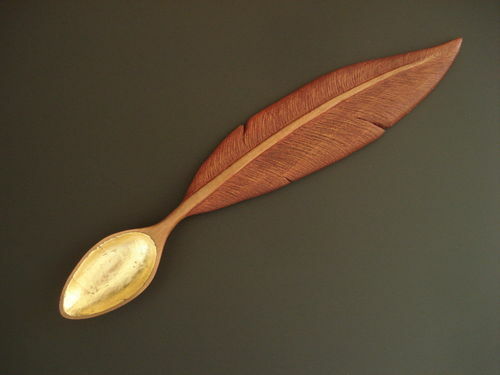 I really liked the finish on Norm Sartorius’ spoons and this is what he uses. Call me a copy cat! But the dang stuff is expensive at almost $40 quart. And then, it wants to dry up in the can once it is exposed to air. Some folks drop marbles in or squeeze the can to keep the air out but that is too much trouble for me. I just use what I can until it goes bad and start saving up for another can. It is that easy wipe on, wipe off, buff out, repeat that I like. I haven’t quite got the technique down yet, but I am improving a little bit. No matter which finish though, it seems like the wood used makes a big difference. Sometimes it will look almost glossy with a couple of coats and some woods I can get 6 coats on and it still looks a bit dull. I suppose it has to do with the density of the wood, but it seems more inconsistent than that. My ears are open to any interesting finishes that I haven’t tried. I mean, only the easy, foolproof ones. 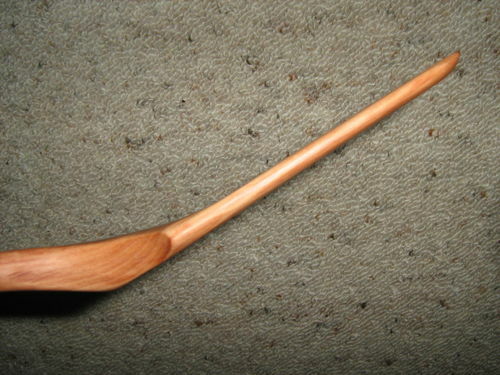 As for the spoon carving, I finished 2-3 new spoons that aren’t worth the showing. I had posted at the end of the last blog segment, hoping to see how everyone is coming along. Since it is kind of buried there, feel free to give us and update on your progress, or in some of our cases, regress. Excellent lesson on finishing and I especially like the last line. Will there be an article on ‘Marketing’? Thanks for the info. I have not progressed much since my update in the previous blog post. 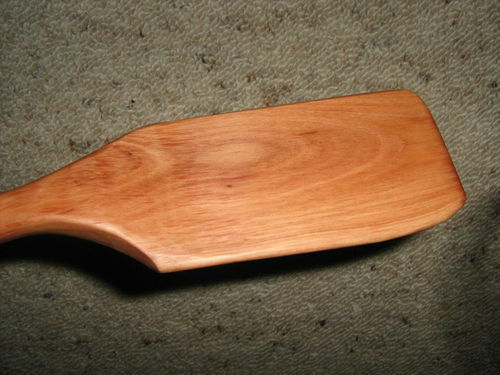 I have been rehabbing some spokeshaves to use on the handles. I haven’t had time to visit the shop for quite a spell to do any carving, but last weekend I did ‘finish’ up a couple previously started. Not one of these was I happy about. The feather spoon was looking pretty good for a while… and then I tried using the wood dye and that sort of detracted from it. Then I tried my hand at the gold leafing and that was a several hour disaster. I wanted to use one sheet but with the concavity of the bowl the sheet would tear as I tried to tease it in with a soft brush. Of course, I didn’t have the sizing… so I first tried polyurethane (no go) and then just white glue. In any case, I didn’t like the final result. The wood is wild apple. Some of you guys get to work with various exotic woods and I finally got my hands on a piece. Not sure of the spelling, but I understand that the natives pronounce the name of this wood ‘em-dee-eff’ and legend has it that only the tribal chiefs are permitted to harvest the wood. I went through the carving process without a hitch and as soon as I went to sand, the neck snapped in two. Superglue to the rescue but it left a dark line so I tried to camouflage it with the black marker lines. Interesting process but I doubt I’d go to the effort again. The third spoon somehow reminds me of the old comic ‘Lil Abner. This is from a weed tree here in FL and I pulled this piece from a brush pile. I can’t think of the name of it right now but that probably doesn’t matter… as I don’t find much to like about the wood. The bark is a bit interesting. This one has a sort of footed bowl to it and if you look at the front, you can see light shining through the wall of the bowl… where I almost carved through. This last photo was also a ‘disaster’. 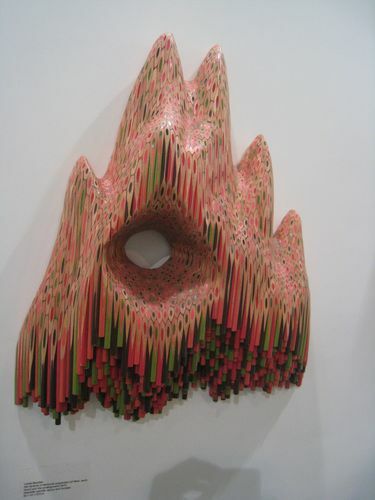 I had the idea of gluing up a blank from color pencils and carving a spoon from that. I figured that all the colored dots would highlight the ‘wood’ in a cool way. I was out of the acrylic resin and tried pigmented epoxy instead. I’ve had good luck with it before so didn’t anticipate a problem. The problem was that I didn’t have any duct tape to use to seal up the joints in my temporary wood frame… so I tried the painter’s tape right before I headed home. When I got back a few days later I found that the epoxy had drained out of the framing block and I was left with a pretty good mess. It is a bit ironic that I would be posting about ‘finishing’ and then each spoon I try to finish goes awry. Such is life. I do hope you are going to try this one again—super cool!! I roughed out another spoon this morning. Playing with the handle style some. 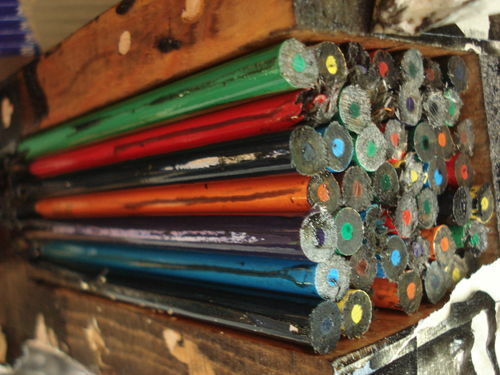 I’m wanting to head to woodcraft today to hunt some tools…. Bent gouge with a flatter profile and a carver’s drawknife…. Wayne ~ I really like the gentle curves on the ‘new’ handle. I think it is going to make all the difference. Is that a ‘Corby’? I’ve heard they are smart dogs. In any case, he gives new meaning to the term ‘bench dog’. 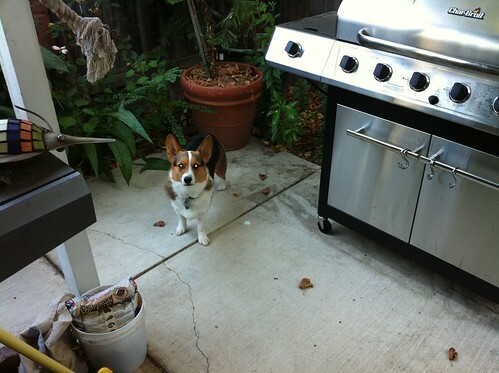 Yes he is a corgi… He is pretty sharp. He has his first level of herding certification on sheep. A bit too gung ho on the home defense. Flaxseed oil is available at the drugstore. That is what is in flaxseed oil capsules. -- Carvin' Tom, Pittsburgh, PA, www.carvintom.blogspot.com No, I'm *not* retired. I am a "recycled teenager!" Thanks Rance ~ That is probably good advice. I was kind of hoping though to have that thin color around the pencils to show up in the final piece. Of course, I bought the dollar store pencils and they are probably too cheaply made to work with. If the idea had worked, I would have been glad to take full credit for it, but the truth is the idea is not original. I’ve had this pic in my ‘design’ file for a spell. I have an author friend in Minnesota that I am in the process of designing the 5th book cover for, and she sent me a couple of pieces of wood… two small pieces of a plum from her back yard and a piece of driftwood found along a lake shore. The driftwood was too far gone (decayed) and the two plum pieces were checked pretty badly on the ends. I cut into one anyways, and here is her first spoon. 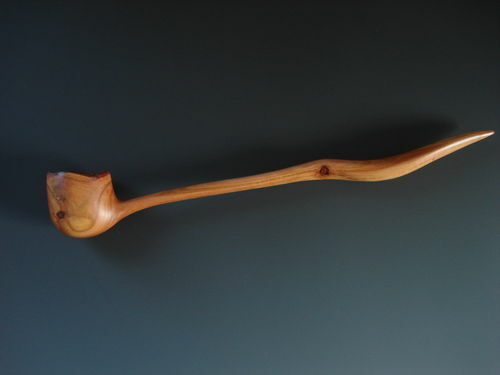 It actually looks more like a ladle… or as my buddy says, a pipe. But I’m calling it a spoon. It is about 10 1/2” long. I am out of the Waterlox finish, so I used some professional grade polyurethane floor finish thinned about 25% with mineral spirits… just wiping on. I just finished two spoons and it is a real challenge for me because I am not a carver and I like to use power tools as much as possible. I did find a 3/4” carbide ball cutter that I used in my die grinder to rough out the inside. It actually got me pretty close and then I used my Dremel with ball bits and sanding drums. The finish I used on these and any bowls that have food in them is Behandla Salad Bowl Finish from IKEA. It is made in Slovenia and has a little packet of directions in the lid in about 30 languages. Essentially you flood the surface with the finish, let it set for 30-60 minutes. Then wipe off the excess and let it sit for 6 hours. Then you buff it with a soft cloth. If it is not up to the sheen you want, wait 24 hours and go through the process again. It does not get shiny like a lacquer or poly finish, but it is food safe. Jim ~ If you are talking about those two maple spoons you just posted, they are awesome… and totally contradict your claim that “I am not a carver”. Very well done and with great lines. I bet they look great with the bowl! Great job! 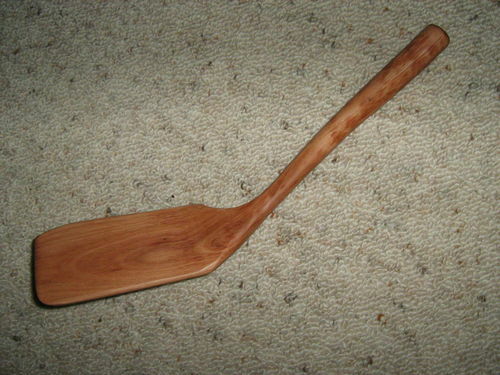 Well its not a spoon ‘cos I chickened out at the last minute and made a spatula sort of thing. Pohutukawa is very hard and I just did not think I could do it justice. I tried to follow the grain with its shape and it has turned out a left handed thing. Not planned but it is as I discovered when I tried to use it. So will give it to my son for flippin crepes. Tried to leave a chipped effect on the handle but it turned out wrong just blotchy. It looks realy nice. I like the lines.